White flowers, buts sometimes tinged pink; mid-green foliage; open erect habit; height to 1-4.5m; spread 61–75cm; leaves in whorls of 4 (sometimes in 3s), to 7mm long; flowers numerous and crowded appearing to form elongated spikes: 1–4 flowers in each terminal umbel at tip of short, leafy lateral shoots; calyx conical, with 4 lobes, white, waxy; corolla white, often tinged pink in bud, bell-shaped to tubular, to 5mm long; stamens 8, included; filaments white, with hairs on lower third; anthers with 2 spurs; style-end emergent, tinged red; nectar copious. Native in widely scattered and relatively small areas in western and southern Portugal; south-western and north-eastern Spain and south-western France (Gironde). Also occurs as a naturalized garden-escape in places are widely separated as Hawaii, Tasmania, England and California. 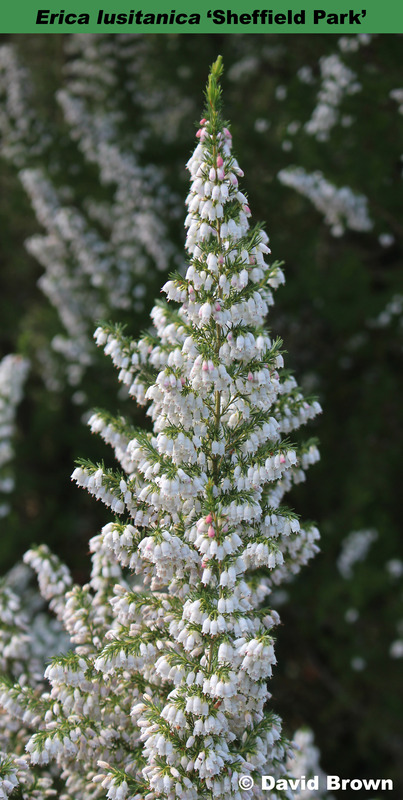 It has the longest flowering period of any tree heath, and will grow in most soils and is suitable for hardiness zone 8. A seedling from Sheffield Park (Sussex) introduced by Liss Forest Nursery by June 1996. Named after the garden where it was found. A plant to get when you can find it!